Autumn is here, the ‘Season of mists and mellow fruitfulness’ according to the poet John Keats. It’s also a time of change to prepare for winter. The vibrant greens of spring became deeper during the summer and now they’re turning a subtle brick and gold colour. Rain nourishes the land. Crops are ripe for harvest. To celebrate the season’s return and capture that moment, I’m using a palette revolving around deep autumnal colours. 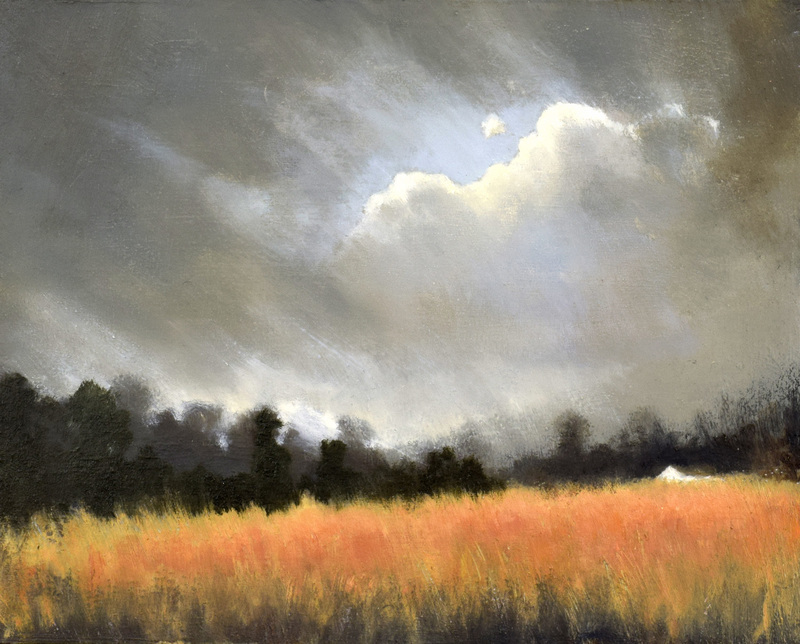 You’ve probably noticed my work often features strong light and dark contrasts and an expressive sky but reaching a balance between all the elements matters too. In this painting the oil colour burnt umber works to unify it. It’s present throughout and helps to create harmony. Then I want to create movement, in part to guide the eye through the painting. The heavy sky leads us, through veils of rain, to a break in the clouds, a fresh blue patch and a white billowing cumulus. These veils of rain circulate around the cloud to give the sky dynamism. In the field, the crop bows gently to hint wind is in the air while the leaden sky intensifies the rain-soaked crop’s rich golden hue. I’d love to hear your comment about this autumnal landscape painting. I really like the window of blue sky created by the rain squalls. It really adds to the movement in the painting. Hello John, I have a love of such rich autum colours and in this painting they really come to the fore in the contrast with the heavy rain-filled sky. The soft and mellow feel is accentuated by the hazy contours of the rain-soaked trees on the horizon. The low angle allows us to view the cottage through the grasses, gently waving in the breeze. There is so much to appreciate in the delicate autumnal light and the visible generosity of nature signalling the end of growth but the start of preparing for new life. Thank you Chris for your comment, yes I agree with you about autumn colours, it is a very special time of year. I think that’s what I had in mind in making the piece, glad to hear that you felt it too.